On February 7, 1934, the Wadsworth Atheneum debuted the modernist opera Four Saints in Three Acts in its new Avery Memorial Theater and, the following night, hosted the official premiere. 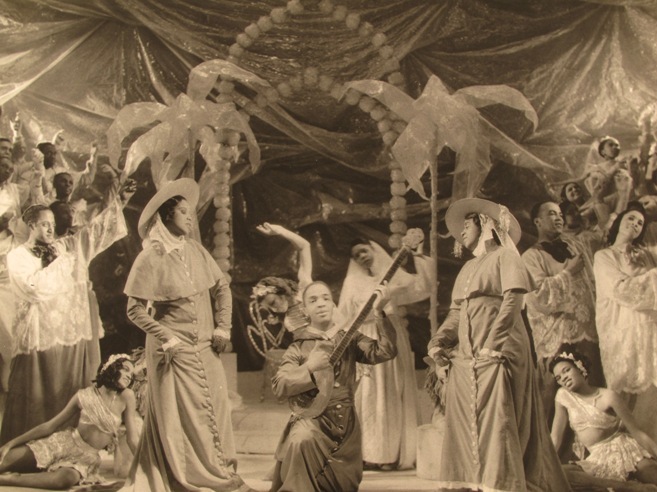 Written by Gertrude Stein with music by Virgil Thomson, the avant-garde production featured an all-black cast directed by noted African American choral conductor Eva Jessye. In addition to being the first opera in the United States to boast a singing roster of exclusively African American talent, the performance coincided, quite purposefully, with another cultural milestone: the opening of the first comprehensive exhibition of Pablo Picasso’s work to be shown in the United States. For the Wadsworth Atheneum’s director, A. Everett Austin Jr. (or “Chick,” as he was known to friends), the evening represented a coup. Prominent figures in art, music, and literature came from the Big Apple, Boston, and overseas to attend the events. Hartford had stolen the cultural spotlight from New York City. longer yellow grass alas pigeons on the grass. In reviewing the Atheneum’s presentation, the New York Times observed, “To be sure, the spirit of inspired madness animates the whole piece. … ‘But does it make sense?’ the serious minded will ask. It does not—to the too serious minded. But neither do ‘Alice in Wonderland’ and other creations of fantasy.” Today, Four Saints in Three Acts is regarded as a landmark of American modernism. “Video - Four Saints in Three Acts.” The Metropolitan Museum of Art, 2013. Link. Watson, Steven. Prepare for Saints: Gertrude Stein, Virgil Thomson, and the Mainstreaming of American Modernism. New York, NY: Random House, 1998.